Parenting a newborn is tough, what with the constant feedings, night wakings, and the total cluelessness the first time around (for some of us, anyway). There’s also the fact that caring for a tiny infant comes without concrete rewards: they can’t say thank you or play with you, and they only smile when they’re passing gas in their sleep! But then, a few weeks or months down the road, the rewards start flooding in. Someone get the mop because this mama is a puddle on the floor! In those instances, there is simply no substitute for that beautiful three-word phrase. But other times, it seems like we’re saying “I love you” on auto-pilot, to the point that it starts to feel overused and even a tad hollow. There are lots of other phrases or questions that display all the love and care we feel in our hearts for our kiddos. Note: I wrote these specifically with kids in mind, but most work equally well with spouses, partners, other family members, and friends! This list is also a great reminder of the many ways other people tell us they love us—even if they don’t use those exact words all that often. 2. I’ve got your back. 3. You are a joy. 4. I’m on your team. 6. How did you sleep? 8. You make me smile. 9. How are you feeling? 10. I’m so lucky to be your mom/dad. 11. You make me proud. 15. Your smile is beautiful. 16. Wanna play a game/read a book/hang out? 17. I want the best for you. 18. There’s no one else quite like you. 19. May I give you a hug? 21. You crack me up! 22. How was your day? 25. Would you like some help with that? 26. You are a good person. 27. I believe in you. 28. I’ll always be here for you. 30. Let’s solve this problem together. 32. Did you have enough to eat? 33. I’m putting down my phone now. 34. That artwork is going on the fridge! 35. You look nice today. 36. I enjoy spending time with you. Grab the free printable list! 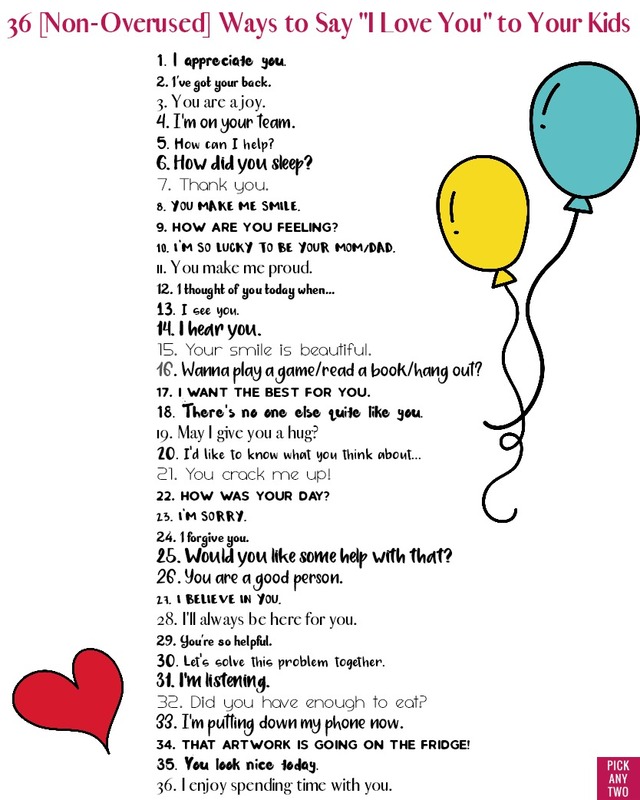 Click on the image below or click here to download your free printable list of these 36 non-overused ways to say I love you to your kids.